OSIRIS-REx arrived at Bennu on December 31, 2018. It’s mission involves in-situ observations of Bennu and a sample return from Bennu’s surface back to Earth. The sample collection will occur in the summer of 2020, and the roughly two year return journey to Earth will start in 2021. The OSIRIS-REx mission is important for space resources because it is a prime opportunity to gather direct observations of a NEA, something done only a handful of times before. The lack of material, structural, and compositional data on NEAs makes it difficult to develop systems that can process the raw material into useful products. We need to know what to expect before commercial systems can be sent to process asteroids. 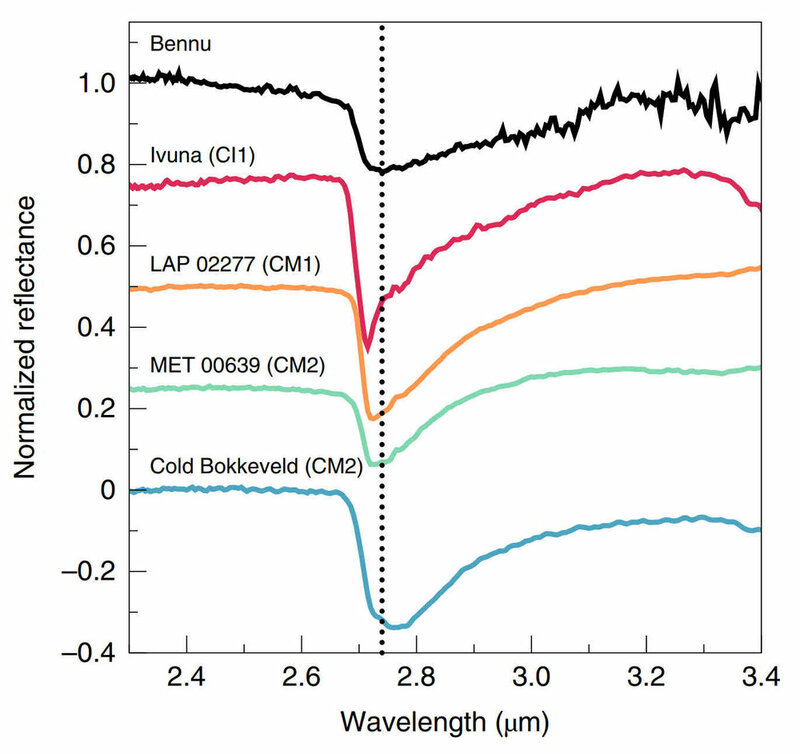 Infrared spectra across the entirety of Bennu has a band at 2.74 microns. This aligns with other CM and CI asteroids. This also indicates the presences of hydrated minerals on the surface of Bennu. The spectra on this chart are offset vertically to maintain clarity. Credit: Hamilton et al., 2019, Figure 2. Even before entering orbit around Bennu, the OVIRS instrument collected infrared spectra that indicated the presence of hydrated minerals. These hydrated minerals are identified by a drop at the 2.7 micron wavelength in the observed spectrum. The bulk of the observed wavelengths are consistent with CM or CI meteorites, both of which also contain hydrated minerals. Hydrated minerals contain water bound to the crystal structure of the minerals. Although much simplified, water can be extracted by hydrated minerals by heating them. This means that asteroid miners could produce water by processing hydrated minerals from asteroids. Even if this water was not pure, simply producing dirty water from an asteroid can still be used as propellant in water thrusters. Purified water can be split into hydrogen and oxygen for propellant, or used directly for human consumption, radiation protection, or other industrial processes. The surface of Bennu contains many large boulders. One large boulder (a) has a diameter of about 56 m and a height over the surrounding area of 20 m. These boulders will be a hazard for OSIRIS-REx’s sample collection landing. Similar features were also seen on asteroid Ryugu and Itokawa. Credit: Walsh et al., 2019, Figure 1. Observations have indicated that Bennu is a loose rubble pile with many large boulders on the surface. Bennu’s density was determined to be 1191 +/-7 kg/m³, meaning that it’s structure is between 25 and 50% empty space. This structure is similar to that seen on asteroids Ryugu and Itokawa. The surface roughness will present a challenge for OSIRIS-REx’s sample collection, and for future missions to objects with similar environments. The most unusual observations made at Bennu is the mysterious ejecting particles. First noticed soon after arrival on January 6, eleven particle ejection events have been observed so far. Scientists are currently unsure why or where these particles are being ejected. The particles are around a few centimeters across, with some are moving at speeds that can damage OSIRIS-REx. Asteroids that eject particles are called active asteroids. Previous research identified that these ejections could be caused by sublimation of water ice, rotational instability, or thermal fractures. The exact cause at Bennu will require more study. Another interesting discovery is that Bennu’s rotation rate is increasing. Bennu currently rotates once every 4.3 hours. However, it’s rotation is increasing by about one second per 100 years. It is thought that sunlight hitting the surface (YORP effect) is causing the rotation increase. Eventually the rotation will become so great that Bennu will break apart. OSIRIS-REx has made tremendous progress in studying NEA Bennu. Our collective knowledge of asteroids is extremely limited. These direct observations are instrumental in allowing future asteroid processing missions to be effectively designed for the environments they are likely to encounter. With three months down and about two years remaining, OSIRIS-REx promises to deliver many more exciting discoveries and answer key questions. Barnouin, O. S., et al. "Shape of (101955) Bennu indicative of a rubble pile with internal stiffness." Nature Geoscience (2019): 1. DOI: 10.1038/s41561-019-0330-x. Hamilton, V. E., et al. "Evidence for widespread hydrated minerals on asteroid (101955) Bennu." Nature Astronomy (2019): 1.APA. DOI: 10.1038/s41550-019-0722-2. Jewitt, David. "The active asteroids." The Astronomical Journal 143.3 (2012): 66. Access: http://www2.ess.ucla.edu/~jewitt/papers/2012/J12.pdf. Walsh, K. J., et al. "Craters, boulders and regolith of (101955) Bennu indicative of an old and dynamic surface." Nature Geoscience (2019): 1. DOI: 10.1038/s41561-019-0326-6.